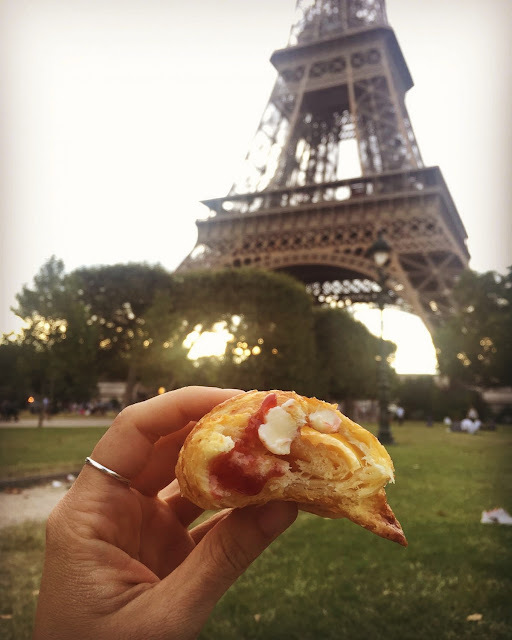 Travels and Trdelnik: Paris...the final part of our trip photos. Paris...the final part of our trip photos. Part three of Paris is slightly shorter than the previous two entries from our trip. On our final full day in Paris, I awoke to find myself gone from having been alive for 30 years to now having been alive for 31. Paris seemed like as fabulous a way as any, to spend it. We headed to Rue de Buci for breakfast, as two nights before during our bicycle tour, we had cycled down this street and were spellbound by all the charming cafes and revelers filling the streets. We had turned to one another from our bikes and smiled, silently vowing to come back. Rue de Buci was quieter during the morning hours, but we were ok with that. I snapped some photos of the ultra charming street and then we settled at Paul for some croissants and quiche for breakfast. Yum! After breakfast, we headed towards Sainte Chapelle, just a short walk away. This is, hands down, one of the most beautiful churches I have ever seen in my life (alongside of the Sagrada Familia in Barcelona). Its made of floor to ceiling stained glass windows. When the light filters through them, its as though one is standing inside a life-sized jewelry box. The chapel was originally built to house the supposed relics of Christ. Pieces from the crown of thorns he wore, and pieces from the cross. Anyway, the chapel itself is magnificent. Truly mind-blowing. I had already been here twice before, so I nearly opted out of it. But I could sense Lexie hoped I would join her, so I did. 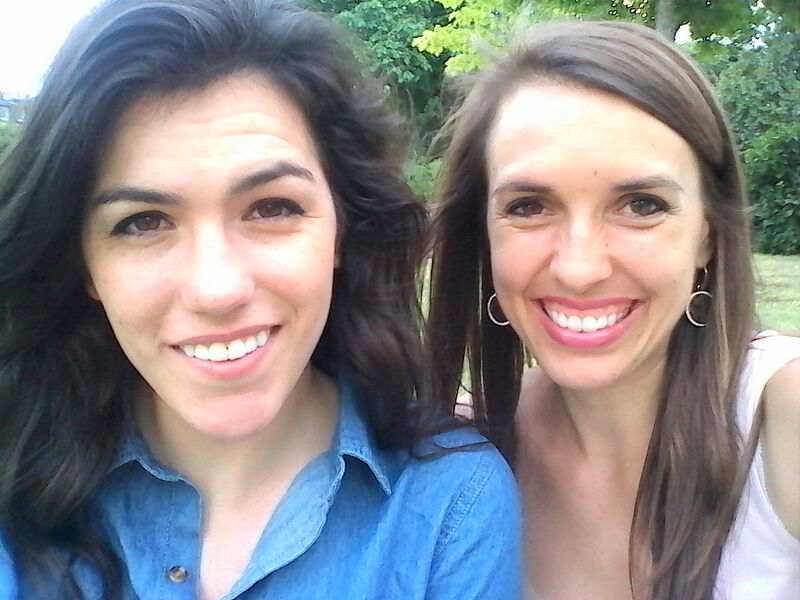 She treated me, sweet sister that she is. Once inside, I was SO thankful I had returned. Sainte Chapelle could never fail to disappoint. Its that amazing. Absolutely come here the next time you are in Paris. I would say its more breathtaking than the Eiffel Tower. After Sainte Chapelle, Lexie and I split off for a while. She wanted to go check out Musee de Orsay and the Louvre. I opted out of those, having been to both. They are each absolutely worth a visit, no question. But unless one is a huge art fan, I would say that once is enough. They are bursting at the seams with tourists. Instead, I decided to find Shakespeare and Company, the famed English bookstore that lay close to Notre Dame, alongside the river. I did end up finding it, rather quickly. The shop was incredible. A mish mash of small rooms seemingly blocked together, a labyrinth of square rooms pushed together, all housing hundreds of tightly packed books. The shop felt old, cozy, winding, cramped, and romantic. I browsed for a while, opting not to buy anything because all of it was so expensive. As I left the cafe, I perused through the bargain book section outside offhandedly. I stumbled across a book that my Mom and I had loved a number of years ago. Its one in a series of books actually, called the Big Stone Gap series by Adriana Trigiani. The two of us loved these books, gobbling up the series simultaneously (my Mom discovering it first and then handing them off to me as she finished them). The one titled Big Cherry Holler sat there, calling to me from the bin. I couldn't believe I had stumbled across that. I snatched it up, sensing it was a sign. For 5 euros, I left with the book. 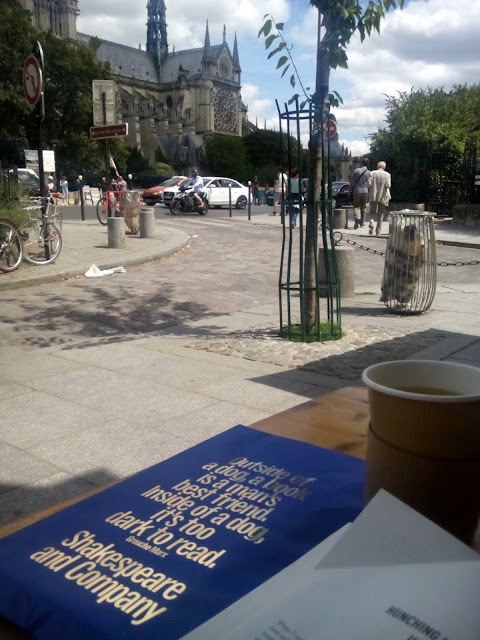 Then I headed next door for a tea and snack, with a stellar view of Notre Dame directly across from me. As I sat with my tea, I wrote in my journal a bit, read some from Wild by Cheryl Strayed (AWESOME book, god do I love that one. Ive read it twice now, and highly recommend it), and opened a touching and heartfelt birthday card from my Mom. After that nice little tea break, I headed off towards the croissant making course I had signed up for, a gift from my D.O.D (Dear Old Dad) for my birthday. I was tittering with excitement over this. Ironically, I put this on my life list a few years ago. 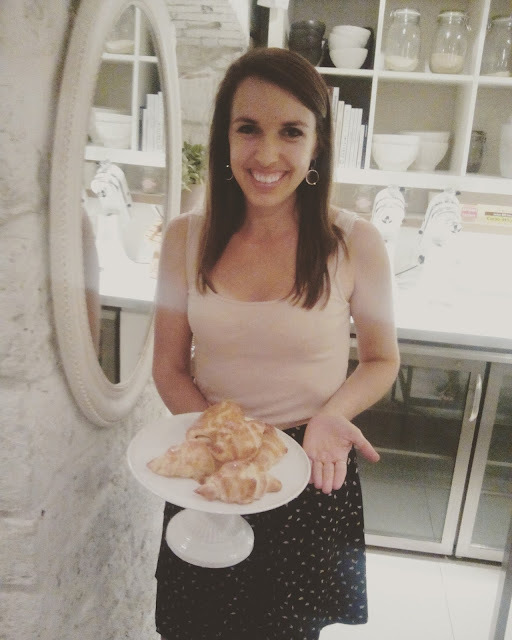 I desperately wanted to take an authentic croissant baking course IN Paris. The day before, I had Googled it, decided, ah what the heck. I don't know if and when I will be back to Paris. Who knows what life will bring, right? So I signed up. I made these!!!! How cool is that!? 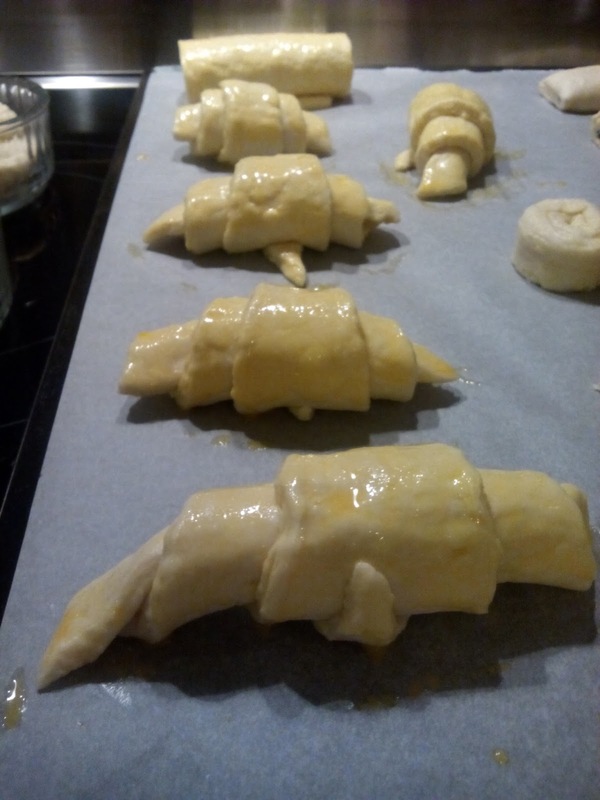 The croissant baking course was AWESOME. Three hours long, taught in English, it was just myself and three other people. A mom and daughter, and a easy going, friendly man from South Africa. We had a great time. The vibe was easy going and chatty. The instructor was warm, friendly and fun. 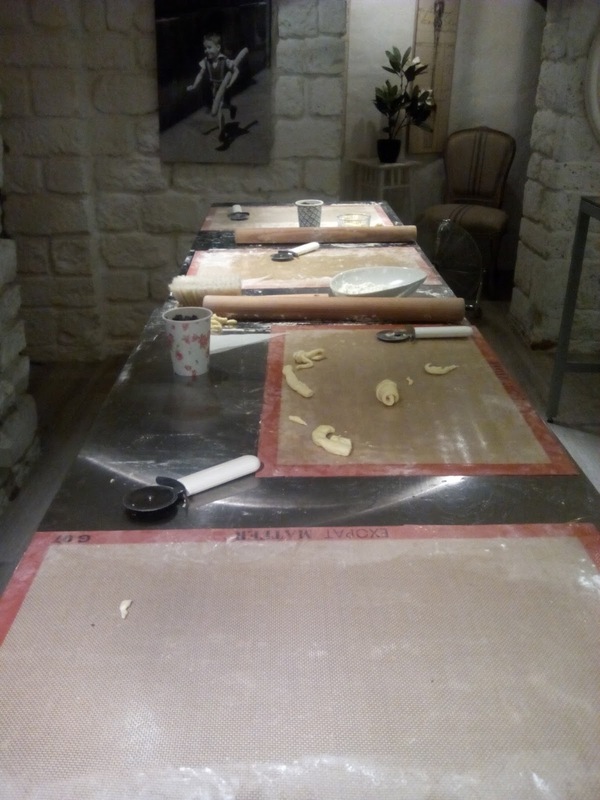 We were able to learn all the folding techniques, literally doing it ourselves with our own hands, each pair of us working on our own dough. We mixed the flour, milk, salt and yeast. We cut and rolled the croissants. And we baked and ATE them!!!! YUMMY! Each of us took home a box of the croissants we had personally made with us. I literally loved every minute of this. Highly recommend it. Afterwards, Lexie came to meet me and we headed towards the Eiffel Tower for our planned picnic on the lawn directly in front of it. We stopped for dinner first on Rue Cler. Then we purchased some fruit and butter to go along with the homemade croissants I had tucked protectively under my arm. 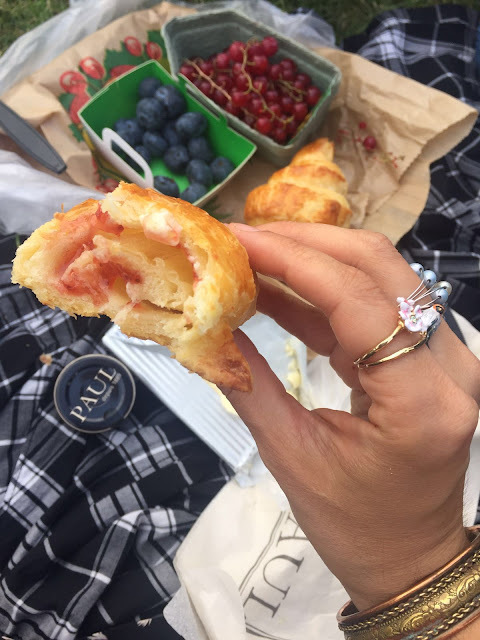 We ate those, staring at the Eiffel Tower as we chatted and relaxed. Two super sweet young English girls were sitting close to us, chatting with one another and taking their own photos. At one point, I approached them and asked if they might please take a photo of us. Afterwards, we found ourselves talking with them for around 30 minutes. We invited them to come and sit with us, the four of us regaling one another with all our travel stories thus far. They were two 19 year olds, having just finished school, best friends on a grand European tour together. They were warm and lovely (Megan and Ellie). Lexie and I watched the tower sparkle, dancing with glittery light, before we bid the two girls goodbye and headed back to our hotel to be up for our 7am flight the next day. AMAZING trip!!!!!!! Oh my gosh, we had such a blast together. And each time I come to Paris, I remember again why I love it so much.